In today’s candidate-driven job market, screening resumes efficiently and effectively remains the most daunting and challenging activity in talent acquisition. An effective hire hinges on the effective utilization of HR technology solution to pick the best fit from a large set of the application pool. The HR vertical is entrenched with various redundant and repetitive task which consumes an unnecessary number of HR personnel hours which can, in turn, be used to build strategies for candidate engagement. AI for recruitment has been a boon for recruiters as it has successfully automated the mundane task like screening resumes and scheduling job interviews, thus reducing the volume of work and increasing the performance levels. The disruptions caused by HR technology has changed the traditional 9-5 recruitment window restriction. The new wave of innovation has opened sourcing capabilities, never seen before, making recruitment a 24/7 service. The smart chatbots, driven by AI, and powered by neural networks, uses natural language processing to have a human-like conversation, without the need to have “actual” human answering frequently asked questions. The benefit of chatbots is their 24/7 availability, at the convenience of the user and on demand. Many time-consuming tasks like scheduling appointments and simple screening questions are handled deftly and as many times as required. AI recruiting assistants, on the other hand, provide instant feedback throughout the process, providing regular reminders via SMS, Whatsapp or email 24/7 and creating candidate experience, mirroring the company’s brand value. The dynamic nature of the IT landscape, have opened sourcing capabilities through myriad sources and is not limited to job advertisements on job portals. Social media platforms like LinkedIn, Facebook have also become sourcing grounds for talent hire. This helps widen the recruitment net, allowing the recruitment agencies to multiply their talent pools, and allowing the power of AI to grade applicants with immense precision, round the clock based on the capability of machine learning algorithms. 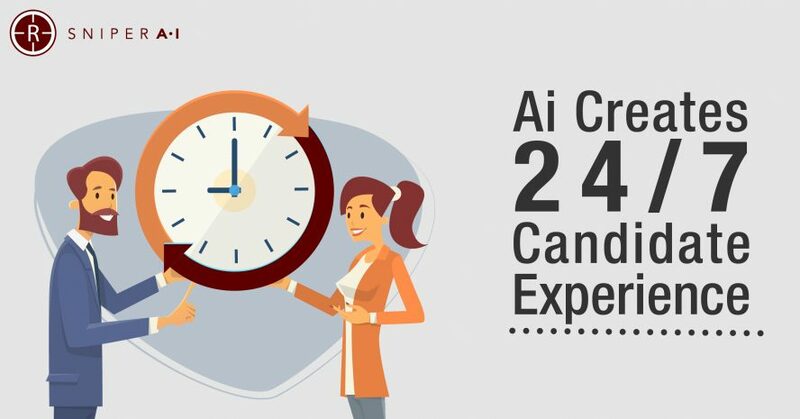 The 24/7 recruitment services with AI, reduce the time to fill and human bias, resulting in faster decision making and a long-lasting relationship with the employees. With the evolvement of new technology, recruitment is going to become more streamlined and around the clock activity. The candidate driven market has put the onus on the recruitment agencies to immediately connect with the candidate following application submittal and focus more on reducing application wait time. AI through its machine learning capabilities, manifested through recruitment assistants and chatbots are changing the way the engagement process in the recruitment process is managed.